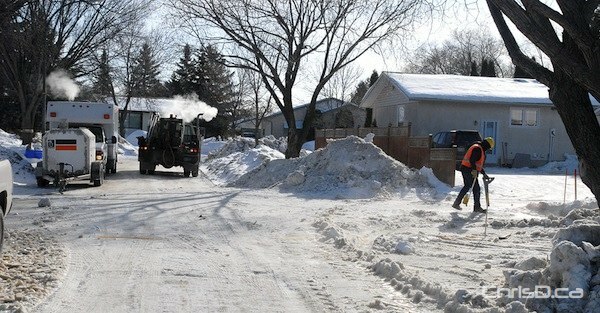 It was definitely not the day for a water main break Friday, with temperatures hovering around -30°C this morning. Residents on Masterton Crescent in the Maples woke up to a flooded street and an icy mess. The city doesn’t yet know the cause of the break, or if it’s a break at all. A spokesperson says crews won’t know for sure until it’s dug up for inspection. About 30 homes in the area are still without water at this time, but clean water is being provided by portable water trucks. There is no time frame on when repairs in the area will be complete.